This beautiful drawstring bag has a nice sturdy bottom to hold your stuff. However, what caught my attention is the beautiful ribbing rows in the middle of the round bag. 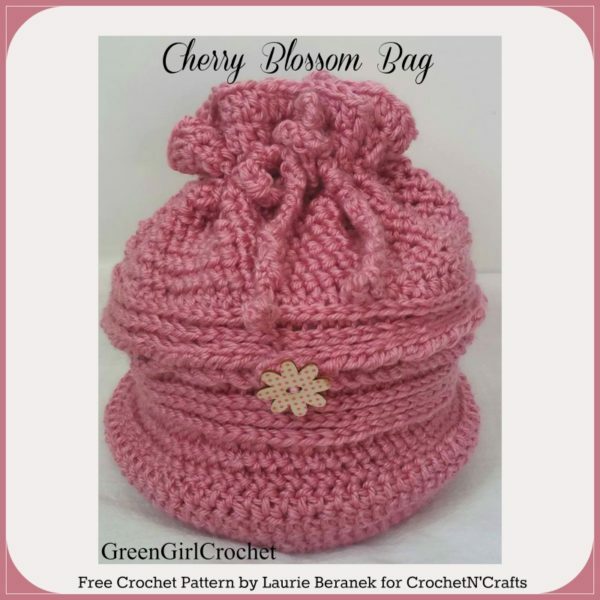 The finished size of this crochet bag measures 6″ across the diameter and 9″ tall. It’s the perfect size to hold your personal items for traveling, the beach, a gift bag, or for storing away your treasures and trinkets. 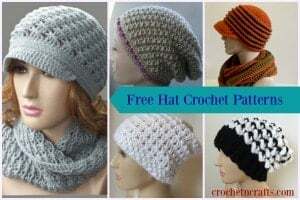 The free crochet pattern is designed by Laurie Beranek of GreenGirlCrochet. Thank you so much Laurie for providing us with such a beautiful design! Herringbone Half-Double Crochet (hhdc): Yo, insert hook into next st, yo draw yarn through st and first loop on hook, yo draw through both loops on hook. QuadTR (Quadtr): Yo over five times, insert crochet hook into next st, yo and pull through stitch, leaving 7 loops on the hook, yarn over and pull through the first two loops, leaving 6 loops on hook. Yo and pull through the first two loops leaving 5 loops on hook. Yo and pull through the first two loops leaving 4 loops on hook. Yo and pull through the first two loops leaving 3 loops on hook. Yo and pull through the first two loops leaving 2 loops on hook. Yo and pull through the remaining two loops. Working in the Round: Ch 6 and join with sl st in first ch. Rnd 12: sc in next 5 sts, 2 sc in next st, *sc in next 10 sts, 2 sc in next st; repeat from *around. – 72 sts. Sl st into beg st.
Repeat as for inside bottom, At the end of Rnd 12, do not fasten off. Rnd 21: Ch3, dc in each st around; join to top of ch 3. – 72 sts. Ch 2, sc in 2nd ch from the hook, (turn with the last st made turned to the left so the back of the sc is facing you). Sc in the strand on the left side of st, *turn last st made to the left, sc into the parallel two strands on the left side of st. Rep from * until drawstring measures 25” long in length (or to desired length). Fasten off. Weave in ends. Designate the front of the bag, Weave the Drawstring I-Cord through every two loops around rnd 21. Knot ends of I-cord if desired. Choose which loop you want to start your braid. Twist the loop once to create a loop space and pull each loop straight through the loop making a new loop for the loop after, until you reach the end of the row. (You can use your fingers or a large crochet hook to make the braid). Pull and squash the sts to even out the row. With needle and thread attach the button and pull the loop over the button to secure. Or, how about this cute cherry blossom flower applique from Repeat Crafter Me. Laurie is an Indie Fiber Artist who was taught the art of crochet by her grandmother when she was a young child. It wasn’t until a life-changing diagnosis in 2011, that she took up crocheting again. She began designing her own patterns in 2013, when she could never get the pattern gauge right and kept altering patterns to suit her own style. You can reach her via email at [email protected], Facebook at fb.me/GreenGirlCrochet or Instagram at GreenGirlCrochet.